Howdy y’all! I’m Emma Uecker, and I have been an employee of WPGR since the summer of 2014. I, along with most of us here on the ranch, wear many “hats”. I work in the barn and out on trail rides mostly during the summers, but I also do housekeeping, work in the kitchen, and do whatever odd jobs that need to be done. 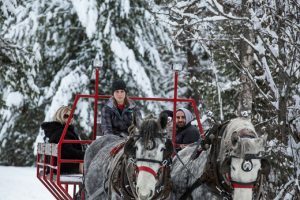 During the winters, I bounce between kitchen/waitress staff and learning how to drive the draft horses outside. 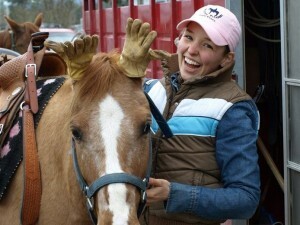 I started my journey with WGPR by taking riding lessons from Janice herself when I was 10 years old. After that, horses immediately became my passion. My first horse, Zipper, was actually one of their horses that I took the majority of my lessons on, rode for their horse camps, and participated in Horse 4-H with. Taking lessons with Janice turned into attending and completing 4 consecutive years of WPGR’s summer Youth Horsemanship Program. After “graduating” from the horse camps, I babysat Danielle’s two adorable kiddos for a few years, which was when I learned how to change diapers, and Danielle gave me some Fiddle lessons in return. When I was 16 years old, I got the call I had been waiting for… the offer to be a Jr. Wrangler for the summer! I was a Jr. Wrangler for the next 3 summers learning the ropes, and in 2017 I became a licensed Wrangler. When I’m not at WPGR, I’m riding my own horses at home which is about 45 minutes south of the ranch. The WPGR staff is my second family, this is my second home, and I truly love my job. Thanks for taking the time to get to know me, and I hope to get to know you while sharing this little piece of Heaven with you! Happy trails! Hello. I have been employed at the Ranch since 2005. My first job was washing dishes and keeping the wood box full. As the years passed I began taking on more responsibilities and jobs. Now I do pretty much anything you could think of. From taking out the trash to building barns and yes I still have to keep the wood box full. Along with working at the ranch, my wife Libby and I live there as well. 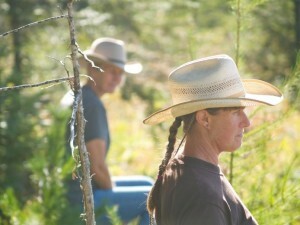 Roley and Janice are my parents which means I am a fourth generation rancher. Horses have always been a part of my life, for as long as I can remember I have been riding. 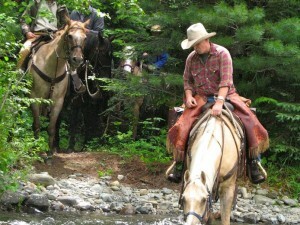 Currently, I am a Wrangler and also help train the young horses on the ranch. So come take a ride! “Howdy Folks”. 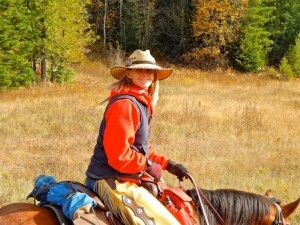 My name is Kim Dana and I have been working at the ranch since 2011. I started during the sleigh ride season, as one of the drivers. When I’m not driving the drafts you can find me helping where ever the ranch needs an extra hand. During the summer months I trade my driving lines in for a set of bridle reins and the wagon seat for a seat in the saddle as a wrangler. When not at the ranch I am at home, which is south of town. I have been married to a wonderful man; John since 1998 and we have one son named Cody. For as long as I can remember I have been blessed to be involved with horses. I was around 15 when I learned to drive draft horses and I did some showing with them for several years. i had a saddle horse of my own and mainly did trail riding with them; so I can say I grew up with the best of both. Recently I have started learning the discipline of reigning, I am looking forward to all the fun and experience along the way. So there’s a little about me, I am looking forward to meeting you and learning a little about you. See ya’ll soon! Well Howdy! My name is Liz and I’ve been working at Western Pleasure Guest Ranch since 2015. I, like Kim, started in the Winter driving the big horses. And started as a Wrangler in the Summer of 2018. I have a long history with driving horses. I started showing driving horses when I was 10 with a local family and instantly fell in love. I have worked with several different breeds and show hitches in the US and Canada. I also worked with a breeding program that breeds and raises the famous Budweiser Clydesdales! My love for driving doesn’t outweigh the passion I have for riding though. I enjoy trail riding, packing and overnight camping on my horses but my heart is all about barrel racing. I have traveled all over the West competing in rodeos. I definitely have a need for speed! I have even tried to dabble in roping but I usually just end up roping myself! I have 2 beautiful daughters Kelly and Bailey who both share my passion with horses, a wonderful family and I love everything outdoors. If I’m not riding you can find me kayaking, gardening, boating, shooting, camping, hiking or just soaking up all the beautiful views. I look forward to getting to know each one of you and sharing this beautiful part of the country. So bring your hat and get ready to build memories of an adventure because the best part of memories is making them! Hey! My name is Patricia, I have been working at Western Pleasure since 2011. I started coming to the kid's camps and from there moved to babysitting Danielle's children. After that, I did a little bit of everything, from working in the kitchen, housekeeping, Jr. Wrangling, and finally Wrangling. 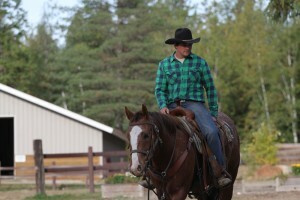 I started riding when I was 9 and quickly joined 4-H horse (at Western Pleasure of course) and from then on I was hooked. 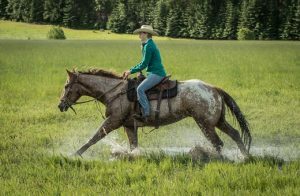 I grew up south of Sandpoint on an Organic tomato farm (just tomatoes, and lots of them), I love anything outdoors and love spending time with my personal horse out on the trail. My favorite kind of rides involve lots of bushwackin’ (finding new or unexplored trails that may have a little brush to work through). I am currently going to college and studying to be a Nurse. Look forward to riding with you!